Nothing new in the west? Well, in the east there is! 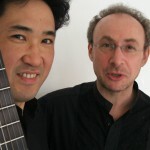 Life lines meet in a suburb of Hamburg: Russian balalaika player Alexander Paperny und Japanese guitar player Satoshi Oba make up their minds to form a duo. 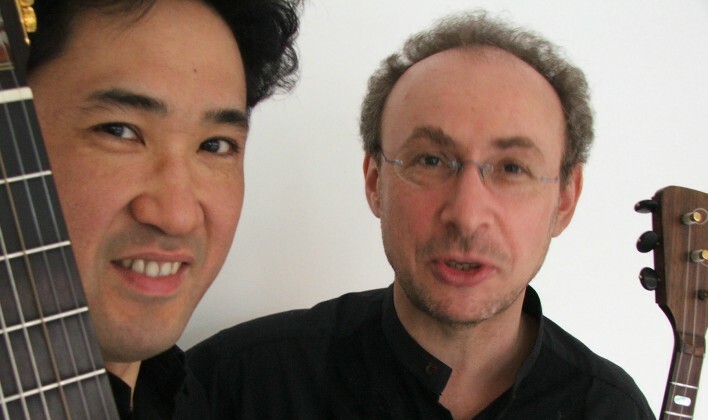 Alexander Paperny travels frequently and fast: He performs on three continents as a soloist with various partners and orchestras, while Satoshi Oba presents his music on more rare occasions. These different attitudes create suspense and harmony at the same time. The balalaika is daring, swift and plaintive, while the guitar adds sentiment and warmth. As composers have not yet written many original musical pieces for the interaction of the balalaika and the guitar, all the experience and competence of the players are required in order to arrange the wealth of repertory that is waiting to be discovered in Japanese and Russian folklore, in Brazil’s Shoro and in Argentina’s Tangos. All this is being offered by the “From East …” duo. They are promising an artistic surprise. 2 Kommentare zur "Duet “From East…”"
Es war so eine bunte und witzige Mischung, dass die Zeit wie im Flug verging. Ich fand die ganze Vorstellung einfach toll! Vielen Dank und weiter so!!! Es ist sehr zu empfehlen!